Q ) Please tell us about your early experiences in Aikido. A ) In April of 1963 I was twenty years old and attending Asia University in Tokyo, it was at that time that I first became involved in Aikido through the University's Aikido Club. The Head Instructor for that club was Tamura Sensei (Tamura Sensei is now a Chief Instructor of the French Aikido Federation). Tamura Sensei's size belied his extraordinarily powerful waza. But of all his characteristics, the one that endeared most people to him (including myself) was his humanity. I think many people, of course including myself, began (and continue to begin) Aikido thanks to this wonderful man. So it was April when I first entered the Aikido Club, and the next testing was in June. That was the first time I met Osensei (Morihei Ueshiba). I was fascinated about the atmosphere that surrounded him. He was completely different from what I imagined a Martial Artist to be like. He seemed to have a divine sense of purpose. The impression I got from him was that anyone could improve their inner-self by continued practice of Aikido. Q) Please tell us about your experience as uchideshi (live-in student , apprentice) to Osensei. A) It was in 1967 that I officially became uchideshi to the Founder. I had been going to Hombu Dojo for the previous five years, as well as training at the University Club Dojo. As uchideshi, I was often able to take ukemi for Osensei. That was the main way that he taught us. Also I accompanied the Founder during his journeys. And while in Tokyo, I would meet him before the morning practice, and then go in to practice with him. Aside from that there were always small things that needed doing around the Dojo. I guess you could say that my main job was to see to the every day happenings at the Dojo. There was always something to keep me busy. Q) What were some of Osensei's teachings that you find most important? A) That we are "living here and now" and we should do our best at this point in time. The Founder said to me "Aikido is a plus within a circle" . The circle symbolizes the Universe, and the plus is a point in space without time. To be here now is most important. If you spend time worrying about tomorrow or yesterday, it is empty here and now." Although planning and reflection are important, you should concentrate on doing your best right now. This is similar with a philosophy of Zen. The Founder was at an old age when I became his pupil. To look at him you wouldn't think it, but he was very strong. Another thing that impressed me about him was his generosity. When we would have tea together, he would offer me half of his okashi (a Japanese snack) saying "you, eat!". There were frequent times during traveling when we would eat at a restaurant. Before leaving, the Founder would often purchase a small gift. This he would give to his wife upon returning home. He was always very kind to her. She was always around and we called her Oku-sama (honorable wife). The Founder was also very devout. Whenever we would pass in front of a shrine, he surely clasped his hands together and said a silent prayer. I didn't feel that the Founder was the type of mystical person that some people had written about in books. I would describe him as a strict teacher, but also very kind, warm, sympathetic and magnanimous. I believe he had a deep love for all life. Q) What was your daily schedule when you were an uchideshi? A) I would arrive at the dojo at 5:30 am. First I would clean the office and then the hall. Shortly before 6:30, I would meet Osensei in his room on the second floor. Then we would go to the third floor for practice. Practice lasted for an hour (until 7:30). There was a short break, and then another practice at 8:00. After that practice there was a morning meeting at 9:30. When the meeting finished I would have breakfast. At 10:30 there was Tokukei practice which is like a private lesson. After that, if there were some errands to do I would do them, or if Osensei was going out, I would go with him. I would usually have some lunch around this time. There was practice again from 3:00-4:00, and from 5:00-6:00, and the last from 6:30-7:30. I used to like to practice Shodo (Japanese Calligraphy) when I found some time. Once, Osawa Sensei (Hombu Dojo Chief Instructor) found me and asked "Did you clean?" I answered him "No, not yet." He told me: "First of all you should do your job--after that -- do your studies." I believe this was a valuable lesson for me. Q) Could you please tell us about training at Hombu Dojo at that time. A) It was quite the same as it is here (at Shohei juku, Suganuma Sensei's home dojo). The practice commenced with some warm up exercises (stretching). Then we would start with a tenkan or other similar basic waza. Every eight minutes or so, the waza would change, or we would change partners. The waza was always basic waza. The more experienced people would work with the less experienced ones. There was a great atmosphere in the dojo. Practice was a joy. We would usually end with Kokyu-ho and maybe a stretching exercise. Q) Could you tell us about your move to Fukuoka in 1970? A) Osensei passed away in 1969. At around the same time, the job of head instructor in Kyushu opened up. Talk at Hombu was to send someone as a replacement. That's how I arrived here in April of 1970. Q) What was the situation that you found in Fukuoka? A) I felt that there was a lot of room for expansion. There is a large population base here, and I felt it was important to make dojos at spread out locations so that everyone who wanted to practice could do so close to their home. Q) Do you feel that the shidoins who teach classes every day are on their way to becoming teachers in their own right? A) I think it is up to them. Of course I think there is a responsibility for people who learn and benefit from Aikido to turn around and teach those things to the new people who come along. Someone who has a good feel for Aikido and who wants to extend their knowledge to others, I think I would like that person to help with training at the dojo, and eventually I would hope to be able to entrust the matter to them. Q ) How does a person who wants to improve go about doing so? A) Get up in the morning, go to practice, have some breakfast, go to work. In the evening, go to practice again. Q) If we concern ourselves with the physical parts of practice, how can we improve our spirit? A) The philosophy of Aikido is inside every basic waza. 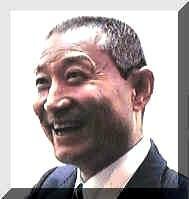 The Founder said "Aikido is misogi". Thus Aikido removes the wickedness from our hearts and helps us to recover pureness (a pure heart). As you follow the path of Aikido, you may feel that you must beat your rival, and that you must be strong during practice. But I think that if you continue Aikido, you will find the purity that you seek. Eiji Yoshikawa (Author of Musashi, and many other famous texts) once said, when he goes to meet someone for the first time he massages his face in order to give a "softer impression". We Japanese don't smile a lot. However, when we smile others smile too. This is also true in Aikido. Q) You have quoted often from Genpei Seisuiki (The struggles between Minamoto and Taira). Could you please once again explain the quote "We are ruined by fighting for power above virtue". A) If a ruler reaches for power, as in war, then he can put forth the power of ten. His opponent puts forth fifteen. He, twenty. The opponent, thirty. Eventually they are both destroyed. But if a ruler is a person of virtue: embodying kindness, love, and consideration, then his power will never wane. He has no warring ambition, yet he will never be defeated. Another way of saying this is: he that rules by power is bound to fail, but he who rules by good will shall prosper. Aikido is a discipline of both the body and the mind. Skill is important but it is no good with out purity of heart. That is what led many people to follow Osensei. It wasn't just his excellent skills, because there were many with such skills. It was his good will that attracted many to follow him. I'm reminded of another saying that is important for Aikido practitioners: it is "masakatsu, agatsu" This basically means "play fair" . If you win, do so reasonably. Don't win with wickedness. This saying also means to "conquer (over come) yourself". First control yourself. This is very important. Thanks very much to Suganuma Sensei and his uchideshi Nobuaki Nakamura and Hideki Takemura. Thanks also to the people who made this interview possible: Miki Takagi, Junko Hirano, Noriko Inue, and Toshiro Nishida.